This is our third generation Di2 Mountian Bike. 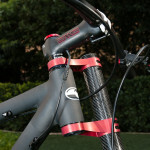 Our Ruegamer bike was the first true mountain bike Di2 conversion and let loose a lot of ideas as to what was possible. The next year, 2010, we rolled out an internal battery 29er with sequential shifting. Sequential shifting was a proof of concept that modified the way Di2 functioned. Instead of two shifters to individually control each derailleur, now all a rider had to do was shift up or down. A brain in the stem would calculate the gear ratios and chose the next gear shifting the rear or both the rear and front derailleurs.With the third build we decided to spend our time refining what we had previously done even though we have a major tech upgrade waiting in the wings. Ride quality was significantly upgraded and even, as a tech geek, this version is my favorite upgrade. The shifters are now mounted onto the brake clamp cleaning up the handle bar. We, also, split the shifters and mounted one on each brake which comes very naturally to me after riding Shimano’s sprint shifters. The plugs are cleaner as is the entry into the stem. Also, the upgrade to a Crumpton Carbon frame really made this bike quick, and at 14lbs very light too. After riding the Titus Di2 29er we had a few upgrades to make to the build kit. Instead of a front suspension fork we used a rigid Black Cat Bone Monoblade. The handmade fork is the fourth out of ten and weighs just over 650 grams. 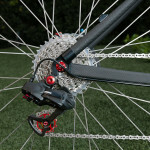 We also added Ashima disc brakes. The modulation is exceptional and will only improve with the next generation. 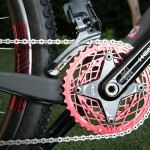 Another quick change that arrived the week before Interbike is the KCNC K3 Cobweb chain rings. We really liked the unique look and ended up using them in the rest of our bikes for this year’s Interbike. Aside from those changes the build was very similar to the 2010’s Di2 MTB. We’re still on our ENVE 29er tubulars with matching stem and Handlebar. The motif this year was rounded out with a completely red and black with the rest of the parts from KCNC. For my road bike, I am interested in having an ultegra di2 “retrofitted” (hacked?) to work on a mountain cassette (11-34 or something similar)with a compact crank. Is this something fair wheel can do, or perhaps you know someone who can? Any help or suggestions appreciated! Can you tell what tuning you did to the rear derailleur? And also the size of the biggest cog of the cassette? Any issues in running the Di2 with normal cage with it? The upper pulley had to be changed to a 10t, the derailleur mount needed to be spaced outward a couple mm. It works with up to a 34, but only in sequential mode where cross chaining is not possible. In standard mode it works up to 32t. Can the brain make it work a triple up front? No it can’t. 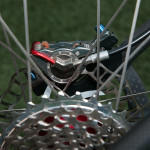 There’s too many issues with throw distance, cage compatibility etc for the front derailleur.